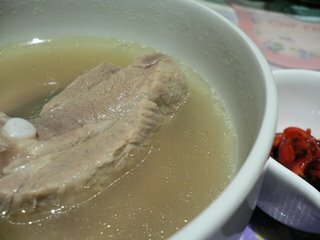 Bak Kut Teh a.k.a 肉 骨 茶! Who doesn't love this? This is 1 thing that has been always on my mind eversince I came here. Thank God, I brought along spices with me to make this. Yesterday was 'Market Day' at spinneys. During this day which occurs on every mondays, a whole lot of really fresh foods & fruits would be imported in to the supermarket. I would say, more fresh than the rest of the days. And guess what, I hop in to the 'Pork Section for Non-muslims only' to look at their pork ribs. They look really fresh & fleshy with not-so-many fats around. Happily, I chose one packet & brought it to the butcher to slice them up for me. 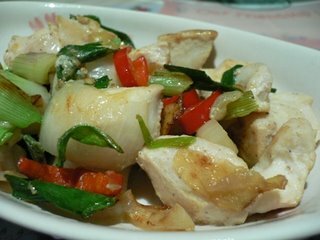 Here's my Stir Fry Fish with Ginger Slices & Spring Onions. 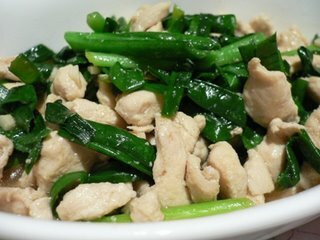 I love this to bits too, usually would order this when I visit 'Zi Char' stall. Afraid that hubby might not have enough to 'da bao' for tomorrow lunch, I made this Ku Chye with Chicken Slices since I still have had lots of chives left after making my gyoza.